L'Oreal has released their new Colour Riche polishes, which if I count correctly, includes forty-two shades. You can view their color charts here. According to their Facebook page, these shades are "a brand new product launch separate from our Pro Nails collection. It will be available in retailers nation wide. The products available may vary from retailer to retailer. This is a product launch so it is Permanent but it will be updated with more great colors." I picked up 3 shades, Safari Chic, Now You Sea Me, and VIP Status. I love that these bottles are still square, but they now have a round cap. My OCD tendancies won't go crazy like they do on their older bottles with square caps that always get out of alignment after the first use! I picked mine up at Meijer using some $1.00 off coupons and bogo half off, but they normally retail there for $5.29 each. The bottles look full sized, but because of the way the interior is formed, the product weight is actually only 0.39 fl. oz. 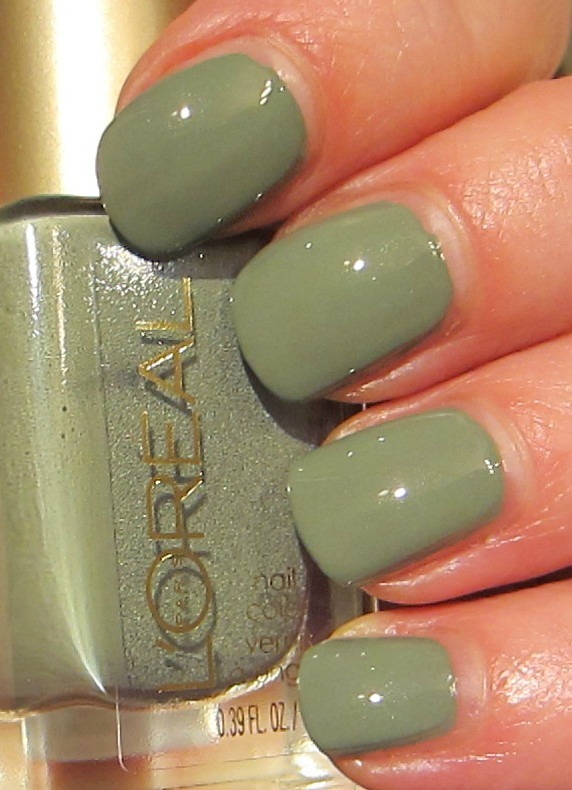 First up is Safari Chic, a creamy olive green shade. 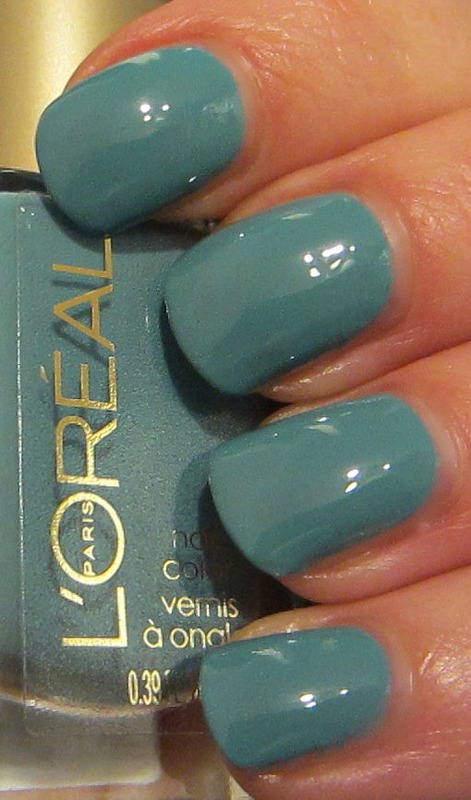 This has pale blue hidden micro shimmer, but it's a shame that it doesn't even show up. For all intents and purposes, this is a creme. 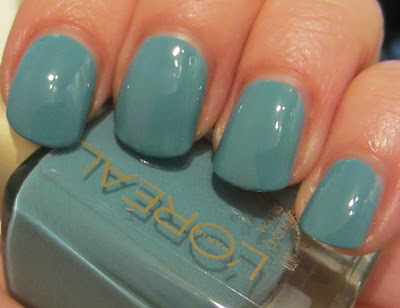 I used 2 coats on all of my swatches, and the formula was excellent. I've always found L'Oreal's brushes to be a bit on the stiff side, but these seemed a little less rigid. Now You See Me is another dusty shade, so of course I had to pick this one up too. This light teal has a touch of green, and I had a difficult time photographing it for some reason. Either my skin was bright red, or the polish was a bright sky blue. The photo above with all 3 bottles shows it looking much brighter and bluer than it really is. I finally was able to capture the true color in lower lighting. VIP Status is a trickster, because it looked like a duo chrome in the store, so of course after my adreneline calmed down from that discovery, I had to have it! I held it up, turned it around, studied it intently...all of this in the store, and the violet and teal were just beautiful. Of course when I got it home, I took it near a window to see its beauty once again, and the duo chrome was no where to be found. It's still a beautiful color, but I think between the store lighting, the plastic label across the bottle front, and the thick glass base and interior curve of the containment portion, all factored in to what I thought I saw. I'm telling you, it was a duo chrome in the store! 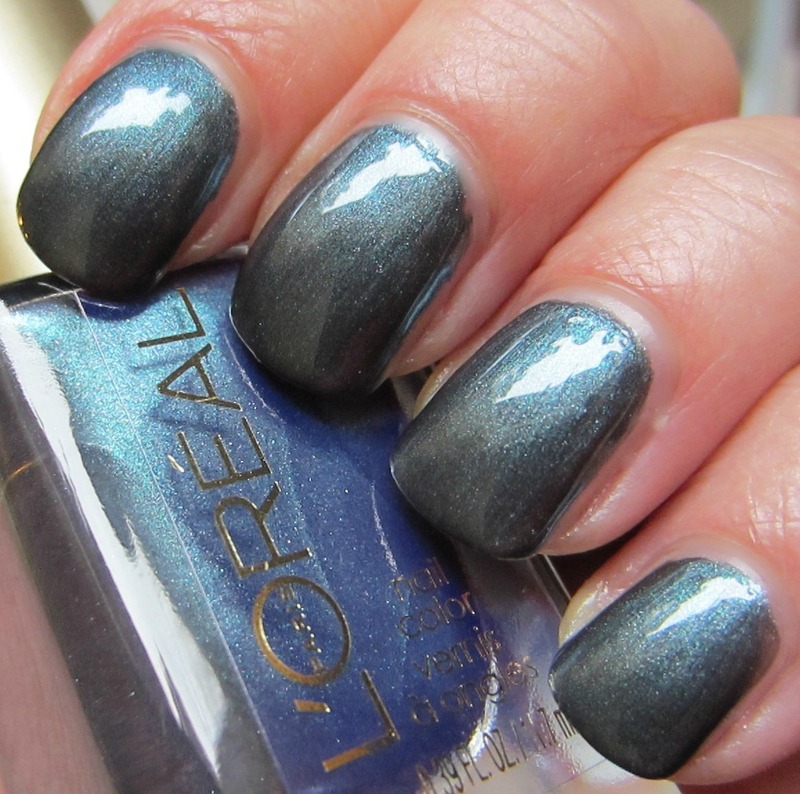 Here's what you'll really see if you pick up this polish...unless you put on your 3D Duo Chrome glasses, that is. 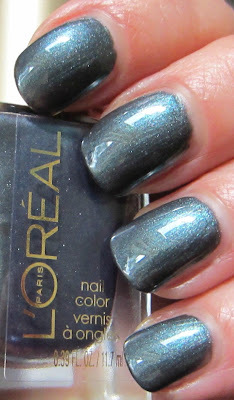 This is a beautiful blackened teal shimmer with a thinner formula than the 2 creme shades I picked up. It still covered well using two coats, and even though its duo chrome got lost somewhere between Meijer and my house, I do think it's lovely. I didn't look through my polishes to see if I had any dupes, but I'd be willing to say that I probably do. These aren't incredibly unique colors to me, but they all have a very nice formula, and I've been fond of L'Oreal polishes since I first became obsessed with nail polish decades ago. Have you picked up any of the new Colour Riche shades? 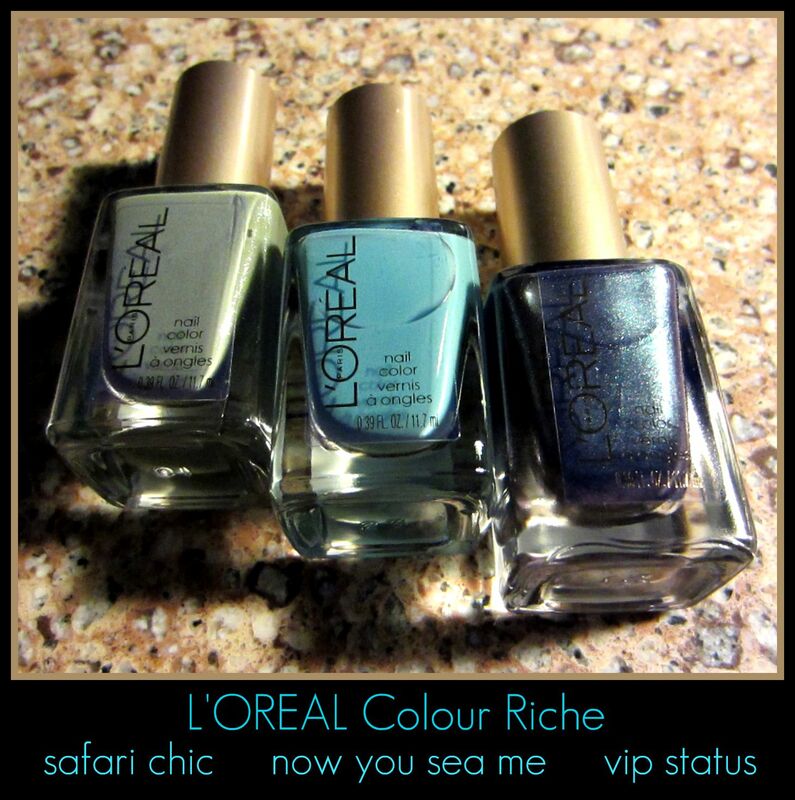 I've been eyeing Safari Chic for awhile now but it's upsetting that the micro shimmer doesn't translate. I'm hoping the Joe Fresh Khaki I picked up feeds that dusty green lemming this polish has created. I was just looking at VIP Status in Walgreen's earlier this evening. I saw duochrome too! Sad it's not there on the nail. Still pretty, I may go back and pick it up with the $1 off coupon. These are all really nice shades I would like to have. 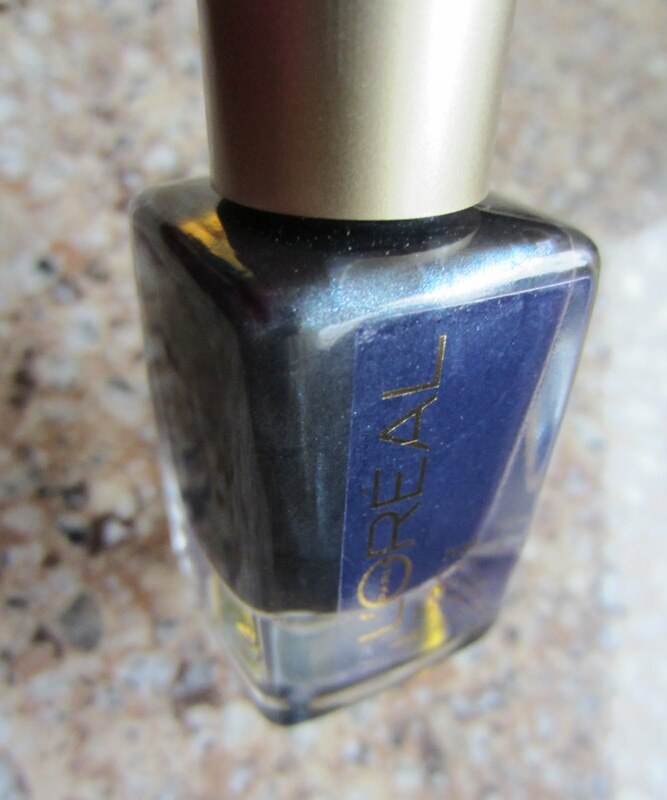 Some reason, all the stores around me took out all the L'Oreal Nail polishes and most of their make-up too. Skin care is still there there but that's it for almost all the stores. I wonder if it's just one more thing that costs too much to ship in here because the delivery trucks are not able to make 30-50 deliveries in one day & empty their truck? It's all about $. Even our Walmart and Target don't carry L'Oreal polish or makeup. They're so pretty. I love Safari Chic & VIP status. I bought a few of this collection. As you say nothing that hasn't been seen before. I do love the square bottles. I wonder if they'll show up over here. I agree with you that they are not unique shades but they are quite pretty and I know I'll always end up getting dupes anyway! I wonder if they have Essie equivalents.